WASHINGTON - As pro-Russian activity rose in eastern Ukraine over the weekend, the White House voiced concerns that Russia might once again advance past Ukrainian borders. Vice President Joe Biden will travel to Kiev on April 22, the White House announced, to meet with leaders in and outside of the government to reinforce American support and talk about Ukrainian security. Last month, Biden traveled to Europe and met with leaders of NATO members Poland, Estonia, Latvia and Lithuania to reassure them after Russia's initial incursion into Crimea. President Obama's National Security Council warned that similar developments were seen in Crimea before Russian forces moved in - and warned Russian President Vladimir Putin not to invade. "We are very concerned by the concerted campaign we see underway in eastern Ukraine today by pro-Russian separatists, apparently with support from Russia, who are inciting violence and sabotage and seeking to undermine and destabilize the Ukrainian state," NSC spokeswoman Laura Lucas Magnuson said in an e-mail. "We saw similar so-called protest activities in Crimea before Russia's purported annexation. We call on President Putin and his government to cease all efforts to destabilize Ukraine, and we caution against further military intervention. We will continue to monitor the situation closely." 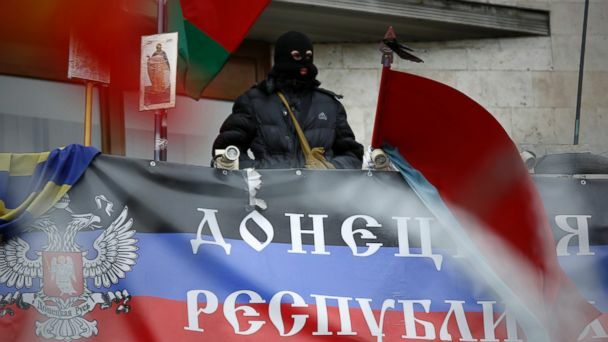 Multiple news outlets reported pro-Russian demonstrations in eastern Ukraine, and ABC's Dragana Jovanovic and Alexander Marquardt reported a number of government buildings were taken over by apparent militiamen wearing mismatched camouflage in the eastern Ukrainian region of Donetsk. NATO Secretary-General Anders Fogh Rasmussen, speaking in Prague, said Thursday that "some 40,000 Russian troops are massed along Ukraine's borders - not training, but ready for combat. We have seen the satellite images, day after day. 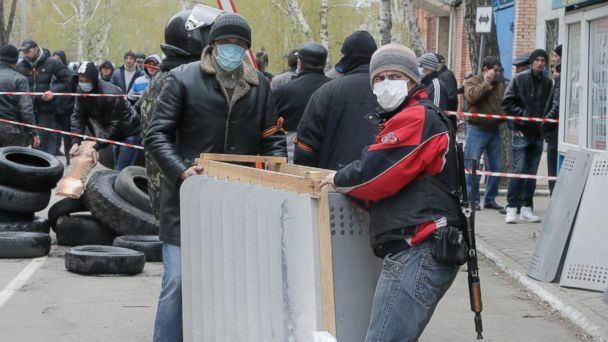 Russia is stirring up ethnic tensions in eastern Ukraine and provoking unrest. And Russia is using its military might to dictate that Ukraine should become a federal, neutral state." As Ukraine considers constitutional reforms, Russia has advocated for a federal system, with a weaker central government and regions enjoying more control. Ukrainian Prime Minister Arseniy Yatsenyuk said on Friday that Ukraine's regions should have more independent powers, Radio Free Europe reported. Russian Foreign Minister Sergei Lavrov, who spoke twice with U.S. Secretary of State John Kerry on Wednesday, denied Russian involvement in eastern Ukrainian unrest on Friday, state-run news agency RIA-Novosti reported. "We don't have any wishes like that," the news agency quoted Lavrov as saying on whether Russia intends to invade eastern Ukraine.